Hope Lies in Less chronicles the unfolding of moments that might, in the normal course of things, go unnoticed except in their passing … Smoke takes flight. Linens are drenched in urine. Routes are traced red upon a map. Blue eggs shatter against the windshield. A girl does not fit in a dollhouse. Invisible ink writes farewell. A lock turns on a hinge-splintered door. Children appear in limbs. Upon the mundanity of everyday details, lives are laid bare and disassembled. This deeply intimate collection of stories explores the shadowed truths of the moments between moments. Within the tellings of threshold, these stories examine what it is to exist thoughtfully in this world … what it is to be human … what it takes to reconcile the darkness with the light and accept that in the end, we all stop casting shadows. Meaning exists, but so does absence. Hope lies in less. Worth every intense breath ... As a longtime reader of Pretty All True, familiar with Kris' unique voice, I felt that the beauty of Hope Lies In Less lay somewhere between the words and the spaces between them. One of the themes connecting the disparate stories is that both events and emotions can be defined by their absence, a beautiful and haunting thought. While several of these stories could easily become novels on their own, each story is beautifully fleshed out and cohesive from beginning to end. I truly loved this collection, and while it tends toward the dark and intense, I do not believe that should scare anyone away. Read this book. Be changed by it. Profoundly beautiful ... You have rendered me speechless. Even in the darkness, you are a profound artist through dialogue. It is beautiful in its sadness. I appreciate your wonderfully descriptive narratives; I always have. Amazing. Gorgeous and can't be rushed through ... I was able to enter and exit each story like a phantom mansion's rooms. This collection is beautiful. It moans and beckons like a ghost that only you can see. The stories here are deep without being difficult; heartbreaking without leaving you mired in pain. A lovely work that is a luxurious read. That is the best type of writing: when a reader says thank you, in the end. Thank you, Kris Wehrmeister. A strong collection from a powerful voice ... Kris Wehrmeister uses words like a magician, casting spells and charms, and drawing the reader in with a power of storytelling that refuses to let go, even long after the last page has been turned. Her stories draw maps from the head to the heart and back again, and leave you wanting to further travel the roads of her explorations. A must-buy collection. Kris has a way of writing that draws you in from the first sentence. Her book of short stories makes you want more. I would read a story and then go back and re-read it and come away with different thoughts and perspectives every time. Most books take you by the hand to a predetermined conclusion that the author think you should arrive at. Instead, Kris lets you get wander down that path all by your self. It is refreshing to find little stories that allow you to think and when you pass it on to your friends, because you will pass this on, a conversation about the path each of you took. It is a highly satisfying book. Once that you will grab over and over again, just to read a story or two, ok just one more. I have been a reader of Pretty All True for a long while and could not wait to read Kris Wehrmeister's first book. My breath hitched a bit as I started this work. It is different than Pretty All True and not what, I didn’t realize, I was expecting. Surprised in what turned out to be a lovely way, I found myself rereading each story at least a few times. It now feels like a beautifully crafted, perhaps crocheted heirloom. Intricately structured with skill, detail and wonderful open work- executed most carefully. Just enough left open to let the too warm escape or the cool breeze enter; just enough for the reader to discover one’s own interpretation while still held by the piece. A work beautiful in its shadows cast as well. This is a book that I will keep close and continue to reach for. My favorite sort of heirloom. And I can’t wait for the next. To have and pass on. I've reproduced only a few reviews here. 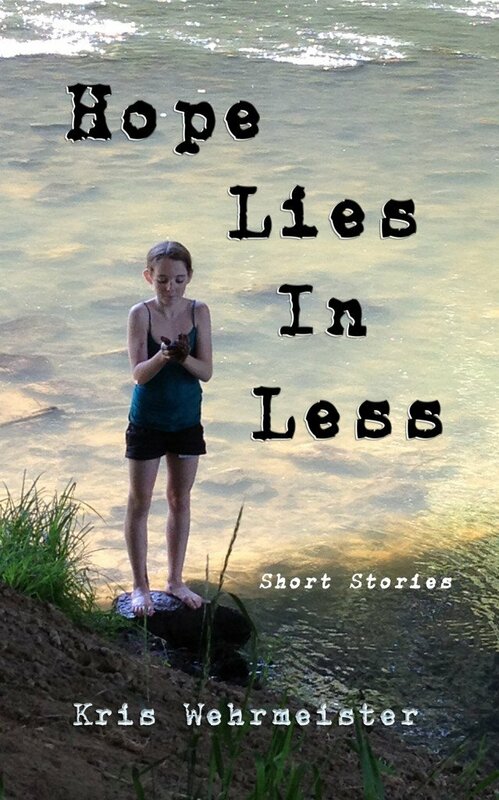 Hope Lies in Less currently has 30 five-star ratings on Amazon.